A Civil War psychological drama, The Beguiled is a more lyrical remake of Don Siegel's 1971 classic. Director Sofia Coppola softens some of the edges but maintains a keen focus on the theme of emotional and physical survival. Rural Virginia, in the fourth year of the American Civil War. While out collecting mushrooms, 12 year old Amy (Oona Laurence) stumbles onto badly wounded Union soldier Corporal John McBurney (Colin Farrell) and helps him back to the school for girls run by Miss Martha (Nicole Kidman) and teacher Edwina (Kirsten Dunst). With the war raging, only a few students have remained at the school, including the eldest Alicia (Elle Fanning), who is bored of all the repetitive lessons. Martha agrees to temporarily shelter McBurney and tends to his leg wound, but fully intends to hand him over to Confederate troops as soon as he recovers. The soldier's presence at the school disrupts the status quo, and he quickly appreciates that he has limited time to influence the women and avoid a prisoner's fate. McBurney uses a combination of flattery, gratitude and seduction to turn the women to his side, but also ignites jealousies and conflict. Director Coppola also wrote and co-produced the film, and The Beguiled overflows with her hallmark soft veneer of natural beauty, gentle light and flowing aesthetics hiding simmering tension. The physical setting is a wooded corner of Virginia at the interface between battlefields - heard but not seen - and an old fashioned school clinging to the vestiges of a disappearing way of life. But the real location of the film lies in the hearts and minds of seven women, suddenly awakened by a manly presence. Coppola aims her attention at the women's emotional state, and McBurney probing for openings to chart a path to freedom through charm, flattery and deception. Coppola spreads the 94 minutes of running time across four of the women. Miss Martha is the pragmatic leader, the woman responsible for the girls and the facility. Yet a man is a man, and despite her cold and calculating demeanour she is not beyond appreciating what McBurney may offer. Teacher Edwina is older than the other girls, caught in a nowheresville life with relatively plain looks. It does not take McBurney long to identify her as the weakest link. Alicia is blossoming into a woman, her sexual awakening kicked into overdrive by the soldier's presence. And finally young Amy can lay claim to having found McBurney, and is just old enough to harbour a crush that he can exploit. Despite the short length the film does drag in the middle act before picking up again as the climax approaches with an eruption of colliding aspirations fueled by alcohol. Compared to the original Coppola strips out some of the characters and more radical incidents from the narrative, leaving the mostly calm interplay between the central characters to carry the entire load of the film, and at times the energy dips to saggy levels. But the performances are uniformly good, with Kirsten Dunst the most quietly expressive, her searching, desperate eyes betraying a heart all too ready to believe in empty promises. 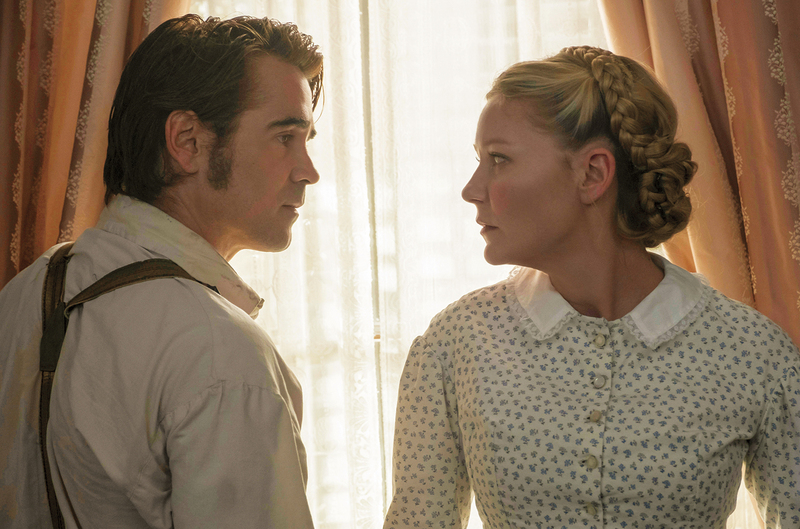 Colin Farrell brings to the role more charm and less obvious dominance compared to Clint Eastwood. The Beguiled is a meditation on the damage unleashed when war seeps inside the walls of civility. The big guns rage outside, but they are no match for the turmoil within.